If your hot tub cover is worn, torn, faded or heavy – it’s time to look for a replacement. With so many options to choose from, finding the right hot tub cover for your climate and budget can seem overwhelming. We will walk you through the different types of hot tub covers and help you determine the right match for your needs! One of the most important features of a durable hot tub cover is the type of foam used. 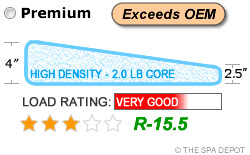 Quality cover cores are made from 100% virgin closed-cell polystyrene foam. Cheap covers are made from many different types of recycled foam, called “re-grind”. While re-grind is cheap to manufacture and allows retailers to sell at a cheaper price, this type of foam soaks up water very quickly and cannot withstand rain or snowfall. As foam density and thickness increase, so does the strength of the cover. For this reason, it does not pay to purchase a lesser model than what your climate requires. A thin cover in a rainy or snowy climate will not only provide less than adequate insulation, it will fail in a short time under the weight of rain and/or snow. 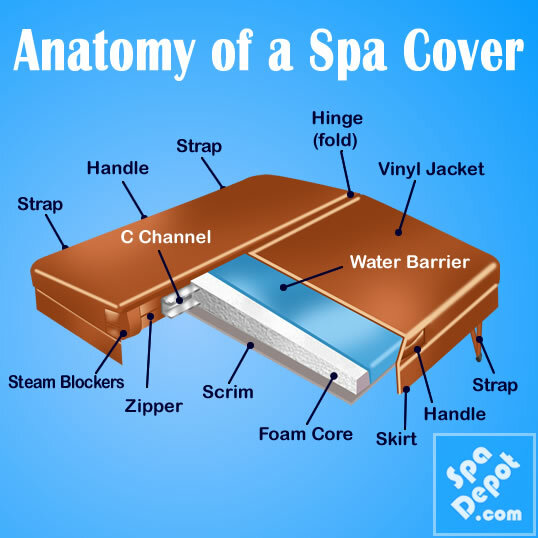 The exterior of a spa cover is made out of vinyl. 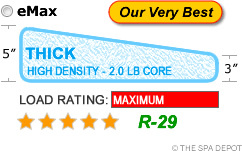 Quality covers are made with 28 oz. Marine Grade Vinyl, which is intended for outdoor use (commonly used for boat upholstery) and is resistant to sun damage. There are many other types of cheaper vinyl available, but they fade quickly when exposed to the elements. While vinyl quality is important, maintenance is equally contributory to cover longevity. The vapor barrier in a spa cover is the plastic wrapping around the foam cores. While quality foam is water resistant on its own, having an additional vapor barrier (or two) around the foam helps to prevent water from collecting between the closed-cell foam beads. 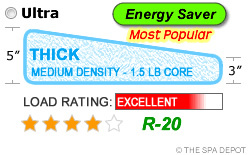 A quality vapor barrier is made from 6 mil clear or blue transparent plastic. Black plastic is cheaper, lower quality and does not hold up as well. The center of every spa cover has two metal reinforcements, one inserted into each piece of foam. This reinforcement keeps the cover rigid and strong. Some cheaper covers use aluminum or PVC material for their c channel. 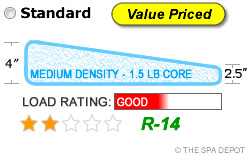 A quality C Channel is made from 20 gauge galvanized steel, which is much stronger than aluminum or PVC. Have questions about finding the right hot tub cover? Post your question or comment below! We live in Fl and have an outdoor hot tub. We have been through 3 covers in 5 years. The rain accumulates in the cover and breaks it down. If we aren’t home to bail it out, it eventually bends until it fills up the center with water. Will a 4 inch thick foam center hold up if we are away during heavy rains? We suggest only using tapered covers so the rain rolls off easily. If your previous covers were tapered and you are still having issues with waterlogging and sagging, then the rain is probably not at fault. If you see these issues, then the chlorine/bromine levels are too high and are damaging the cover. Test more frequently to make sure you aren’t overdosing the spa or consider switching to a more gentle sanitizer. If you are not sure if you have chemical damage or not, then feel free to call us at (800) 823-3638 M-F, 9am to 8pm Eastern, and one of our experts would be happy to help you troubleshoot so you can get more years out of your hot tub covers. Hi, I’m curious of your thoughts about foam weight based upon density. We received a spa cover from SpaGuyUSA.com, foam density of 2 pounds, and the weight is far less than the one we are replacing (which had foam density of 1.8 pounds. For example, I can lift the entire new cover somewhat easily, by comparison the weight of half of the old cover (just one side) (foam only removed from the protective cover) is so great that it’s hard to lift with one arm. 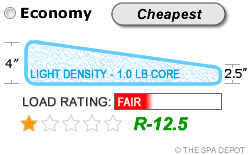 If so, I wish i had visited and ordered from your site earlier and I’d like to expose Spaguyusa.com ‘s misleading website claiming foam density of 2 pounds. I’ve read that foam will increase in weight as water accumulates inside, but this weight difference is huge. Love you site and the content you’re sharing. Thank you for checking with us! It is very likely that your old cover was holding water in the foam, regardless of the density of the old foam. Almost all spa covers start taking on water. When they do, they can get really, really heavy. I believe it’s much more likely that your old cover had lots of water in it, which is why the new cover feels so light. The new cover likely is the 2lbs foam, it’s just so much lighter because it is not soaked with water. I hope this helps, and please let us know if you have any other questions!